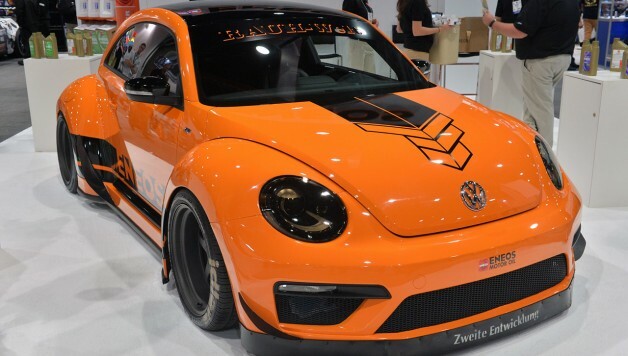 A Volkswagen Beetle that represents a collaboration between Volkswagen rallycross driver Tanner Foust and famed Porsche tuners RAUH-Welt Begriff is set to be unveiled this week at the SEMA show in Las Vegas. 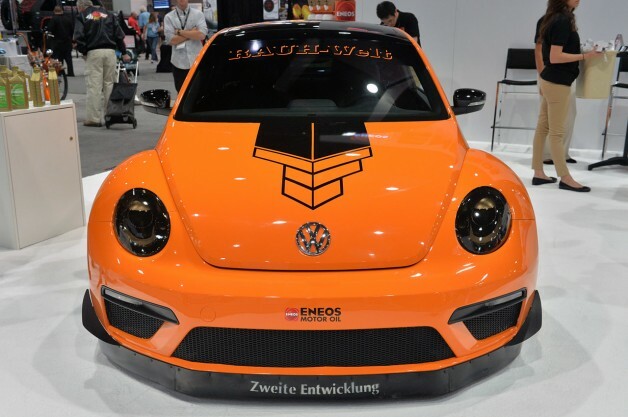 The Tanner Foust Racing ENEOS RWB Beetle will be introduced at the Las Vegas Convention Center in the ENEOS Motor Oil booth (#24723) this week during the premier automotive specialty products trade event in the world. 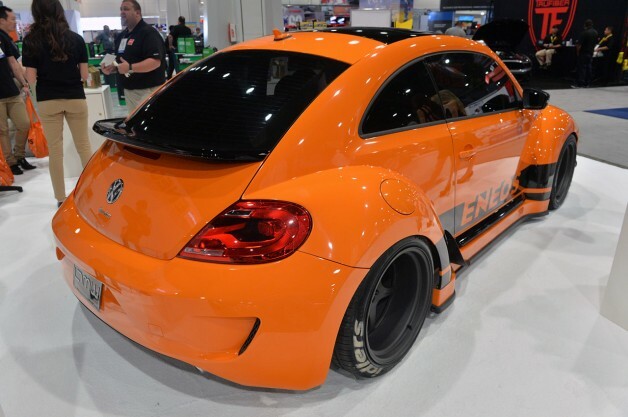 The 2014 Volkswagen Beetle R has been the subject of an extensive design process that added about eight inches of width in the form of a distinctive RAUH-Welt Begriff wide body kit. Foust and RAUH-Welt Begriff’s Akira Nakai have been in talks over the better part of the past decade to do a project together. 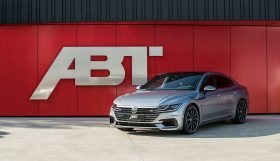 While the Beetle may seem like an unusual choice for a shop known worldwide for its work with Porsche 911s, the historic connections between the two cars made it a good fit — although it required some innovation. 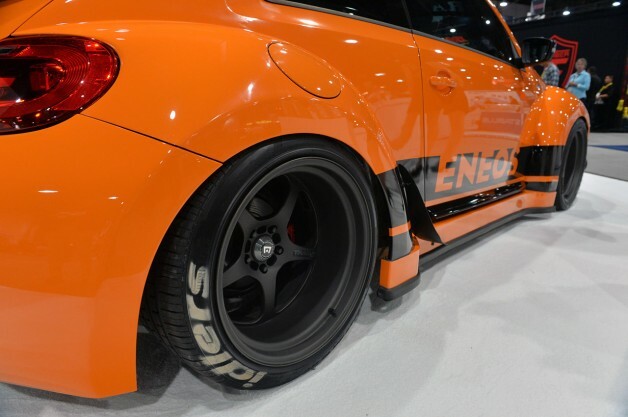 The Beetle RWB sits on custom Motegi Racing Traklite wheels (18×10 front and 18×12 rear), built specially with a one-off stepped lip. 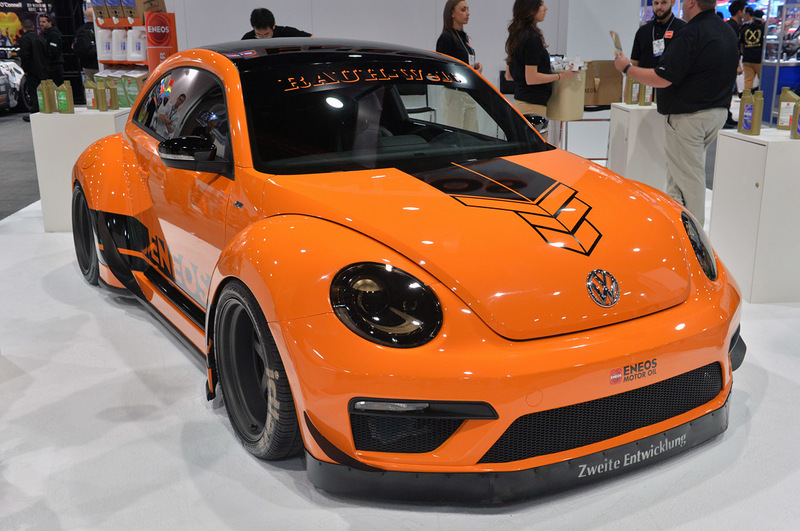 The Tanner Foust Racing ENEOS RWB Beetle also features Volkswagen’s R-Line accessories including an upgraded shift knob and pedal set. Further performance upgrades are in development for the future. 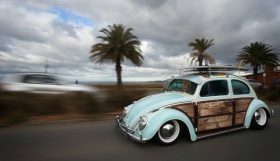 It is the first Beetle project for Nakai. 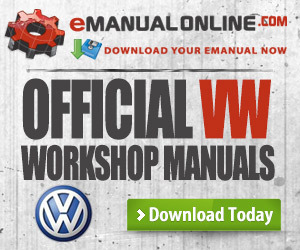 The team at RAUH-Welt Begriff worked with LTMOTORWERKS, in El Monte, Calif., for the build. 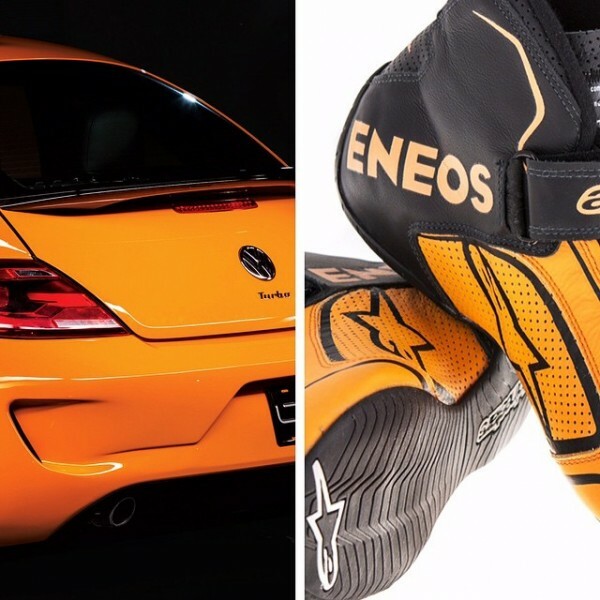 As part of the project, Alpinestars is partnering with Foust and ENEOS for a special shoe giveaway. One lucky fan will have the chance to win footwear from the Alpinestars Auto collection. Foust will be at the ENEOS booth between 9 a.m. and 10 a.m. on Wednesday, November 5 for an autograph session. As a lifelong automotive enthusiast, Foust is a SEMA Show veteran and he said he is looking forward to returning this year. “It’s about making vehicles fit you and what you like about them,” said Foust. 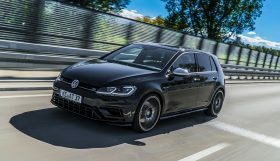 “It’s the place where you see cars that are personalized — whether that’s cosmetically to reflect your style or for performance — and that’s an awesome thing. Additional appearances for Foust next week include a Monday evening autograph session alongside Volkswagen Andretti Rallycross teammate Scott Speed at Findlay North Volkswagen between 7:30 p.m. and 9 p.m., and at SEMA Wednesday with ODYSSEY Battery by EnerSys (Booth #24875) between 11 a.m. and 12 p.m.
On Wednesday evening, Foust will race his Rockstar Energy Drink Volkswagen Beetle in the season finale of the Global Rallycross Championship at the LINQ Hotel and Casino on the Las Vegas Strip. Renowned Porsche tuner RAUH-Welt Begriff is based in Japan, with U.S. operations in California. The company is known for a distinct RWB style that combines Japanese and European tuning elements. Principal Akira Nakai has been designing cars for the street and track for 19 years, and the resulting RWB builds are some of the most coveted on the road today.